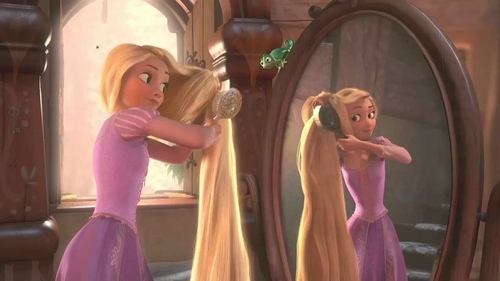 Does anyone own the merchandise for Tangled. For me yes I have the Barbie dolls of Flynn Rider aka Eugene Fitzherbert and Rapunzel which I got today and the Tangled poster. BTW u are so going to laugh your head off but I don’t care cause I love this movie (im 19 going on 20). Hey, I'm the same age as u and I own two Tangled boeken (the storybook and the essential guide) and the soundtrack. I'm planning on getting the dolls, too. Really LOL I thought I was the ONLY one that was childish. I was going to get the merchandise for Enchanted too but where I am from u can’t get them at ALL. So when this film came out I zei to myself I am definitely going to get the dolls for this movie(Rapunzel & Eugene of should I say Flynn Rider nah im saying Eugene) as I love both of these characters. The dolls I got I had to get one of each as they weren’t together in the box so I got them on Friday and I took them out of the box the volgende morning. >3 Tangled. Actually I got quite bit collection already and it keeps adding up! Here are somethings I got: Rapunzel dolls both door matel and Disney Store,Flynn dolls both matel and Disney Store,posters,books,soundtrack,Plushes of Pascal all three colors& Max& Rapunzel,Max horse door matel, little doll playset door matel,pre-ordered movie Tangled,pre-ordered limited edition Rapunzel doll from Disney Store,Rapunzel singing doll,art kits from Disney Store,figure collection,beach towel,Rapunzel costume ordered just got to pay for it,lithographs,lobby card set,post cards,and more! In Taiwan , Tangled's OST is sold out..
We dont have DVD yet but i gonna buy it! !